Typical Dublin. In stealth-like fashion they have crept right back into the mix for a place in another league final, what would be their seventh on the spin under Jim Gavin. 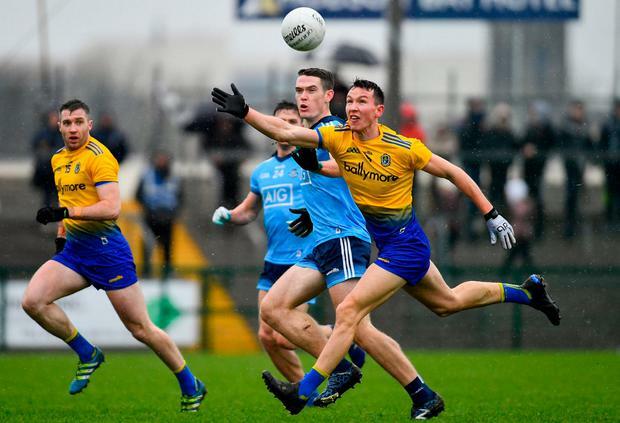 Roscommon, meanwhile, are nervously looking into the relegation rear-view mirror after leaving everything on the Hyde Park field… only to discover that everything is rarely enough against a team of champions. On a God-forsaken day, the hosts played unseasonally good football for 35 minutes to reel the fast-starting Dubs back to parity at the break, 1-9 apiece. Then they had the audacity to sprint from the second-half traps with points from David Murray (on a travel-exchange visa from corner-back) and their perpetually menacing Kerry import, Conor Cox. Surely, as the locals in an estimated 6,500 crowd started to dream, we weren't about to witness a third consecutive loss on the road for the four-in-a-row All-Ireland champions? Over the next half-hour, that question would be answered emphatically. Dublin monopolised possession against opponents who were running on fumes for the last 20 minutes and - gradually - it showed on the scoreboard. Dublin would hit an unanswered 1-5 from the moment Dean Rock converted a tap-over free in the 42nd minute to when Darren Gavin, in glorious space on the left wing, completed their 2-14 tally in the 68th minute. In the meantime, Roscommon went scoreless for over half-an-hour before Aonghus Lyons' 70th-minute consolation point. Rock's scruffy 51st-minute goal was the game's decisive score, his ground shot trickling inside the right upright after Con O'Callaghan and Paddy Andrews had worked a one-two to create pandemonium in the goalmouth. That edged Dublin into a two-point lead, but it would be misleading to describe it as a turning point. The visitors would have won regardless, the points safe even before Conor Devaney walked for a second yellow on 66 minutes, four minutes after his first. Dublin weren't note-perfect in that second half, but they didn't have to be. They were in total control of their own destiny - as they are once more in the bigger Division 1 picture. Two matches ago, they were four points adrift of Kerry and Mayo; now they have reeled in the latter and lie second in the table, ahead of Mayo and Galway on scoring difference. Yet, even with eminently winnable games against Tyrone at home and relegation-haunted Cavan away to come, their seen-it-all manager is not getting ahead of himself. "Our focus now will be on just reviewing that game and learning as much as we can from it," Gavin insisted. "To come to Dr Hyde Park, it's a fantastic ground and to get two points here... they are really well earned. "We want to understand why that happened and then we will shift the focus purely on Tyrone. We have no right to look beyond that game." For Anthony Cunningham, the post-match review will be more painful ahead of critical matches against Galway (away) and Kerry (home). 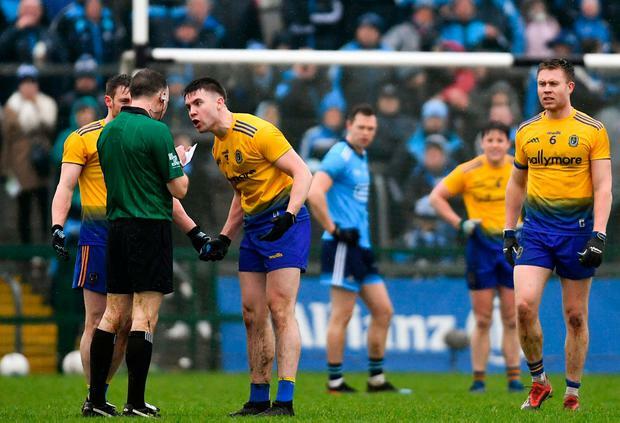 "We're fighting for our lives," he admitted, even though Roscommon currently lie a point ahead of Cavan and Monaghan at the basement end of the division. Saluting the first-half performance as "the way we want to continue to play," he quickly added the rider: "But there's no point doing it for the first 35. We've got to learn." Cunningham continued: "We have to win our last two matches and that's the concentration points for the week. The learning points from today we'll take." 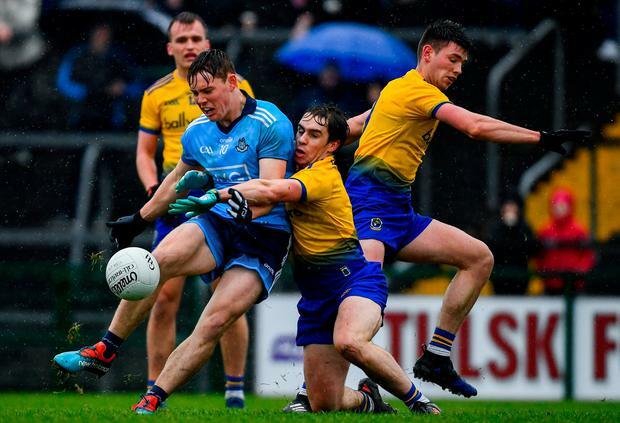 On the day Stephen Cluxton returned to on-field action for his 18th league campaign, some of the younger bucks were instrumental in Dublin's initial dominance in the first 20 minutes. Jack McCaffrey released Niall Scully for a third-minute goal chance that he was content to blast over; soon after McCaffrey departed after feeling a "bit of tightness in his leg," his manager reported. O'Callaghan was buzzing from the first bell, so it was no surprise to see him bury Dublin's opening goal in the 19th minute. The Dubs led by five and you waited for them to push on. Instead, Roscommon outscored them 1-6 to 0-4 over the remainder of the half. The workload was spread, with Cox (who finished with 0-4) central. However, it still required a slightly fortuitous goal from Cathal Cregg in the 30th minute to turn the game on its head. 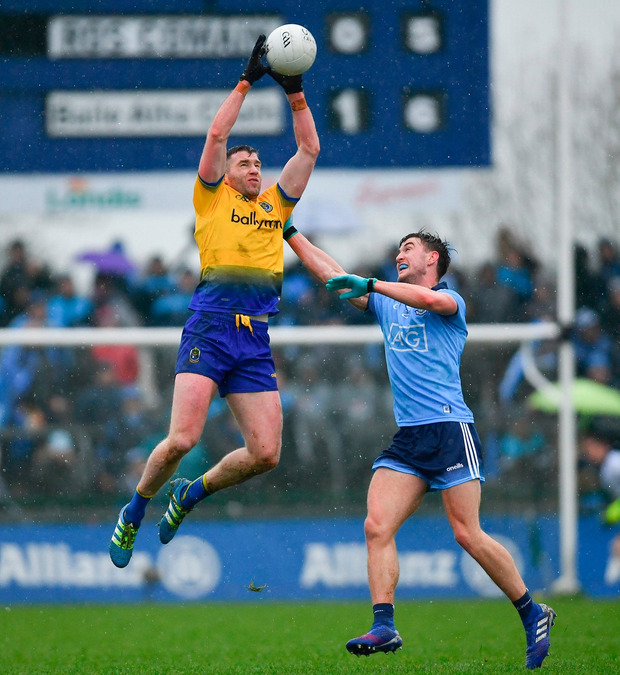 Even though the busy Andrews immediately riposted, Roscommon finished the half with a three-point flourish from Cox (a free), wing-back Ronan Daly and skipper Enda Smith. Game on? Perhaps. But halfway to paradise is never enough against the juggernaut in blue. Scorers - Dublin: D Rock 1-5 (4f, 1 '45), C O'Callaghan 1-1, P Andrews 0-3 (1m), N Scully 0-2; C O'Connor, C Basquel, D Gavin 0-1 each. Roscommon: C Cox 0-4 (1f), C Cregg 1-0, C Lavin ('45), R Daly, N Kilroy, D Smith, E Smith, C Lennon (m), D Murray, A Lyons 0-1 each. Dublin - S Cluxton 7; A McGowan 6, J Cooper 6, D Byrne 7; J McCaffrey 6, C O'Sullivan 8, C O'Connor 7; B Fenton 7, D Gavin 7; N Scully 7, C O'Callaghan 8, C Basquel 6; C Costello 5, D Rock 7, P Andrews 7. Subs: R McDaid 6 for McCaffrey (inj, 10), P Mannion 5 for Costello (45), B Howard 6 for McGowan (51), P Flynn 6 for Basquel (51), MD Macauley for Fenton (72). Roscommon - C Lavin 6; G Patterson 6, C Daly 6, D Murray 7; C Devaney 6, N Daly 6, R Daly 7; T O'Rourke 6, S Killoran 6; E Smith 7, D Smith 6, N Kilroy 6; C Lennon 6, C Cox 8, C Cregg 7. Subs: S Mullooly 6 for Kilroy (52), C Compton 6 for E Smith (inj, 52), A Lyons 7 for Cregg (inj, 57), C Hussey 6 for Killoran (59), H Darcy for D Smith (inj 64).